Enter the first of the numbers to find the greatest common factor for. Number entered should be an integer greater than zero. Enter the second of the numbers to find the greatest common factor for. Number entered should be an integer greater than zero. Enter the optional 3rd of the numbers to find the greatest common factor for. In order to include the 3rd number, the 1st and 2nd numbers are required. Number entered should be an integer greater than zero. Enter the optional 4th of the numbers to find the greatest common factor for. In order to include the 4th number, the 1st, 2nd, and 3rd numbers are required. Number entered should be an integer greater than zero. This is the greatest common factor for the numbers you entered. If the result is one, it means that your entries do not have any factors in common other than one -- meaning no reduction or simplification is possible. 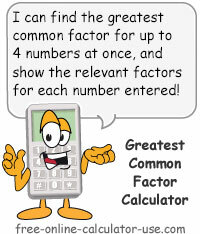 This free online greatest common factor tool will find the GCF of 2, 3, or 4 numbers at once with the click of a button. Plus, in addition to displaying the GCF, the calculator will also display the GCF divisors and all factors for the numbers entered. Also, if you would ever like to save some time when attempting to find the least common multiple (LCM) for up to 4 numbers, be sure to check out my Least Common Multiple Calculator. Enter at least two numbers to find the greatest common factor for. Click the "Find Greatest Common Factor" button. This will find the GCF of the entered numbers, plus display a chart showing GCF divisors and all factors for the numbers entered. Factors, common factors, and greatest common factors. How is Finding the Greatest Common Factor Useful? The most common use of finding the GCF is for reducing or simplifying fractions, which we will cover on the various fraction calculator pages. And that's all there is to understanding Greatest Common Factors.